One of my favorite things about being in Italy is buying fruits and vegetables every single day. I drop in the local Alimentari (grocery store) for apples, tangerines, pears, grapes and whatever else might be in season. I never pick the fruit myself, but I point at the best looking ones and the vendor quickly snatches them and puts them in a plastic bag. I learned my lesson the first time I reached and grabbed an apple to purchase. The woman behind the scale sneered and me and wagged her long finger and in English said NO NO NO. One afternoon a small vehicle road into town. It looked like a mini, mini pickup truck. I believe they’re called Apes. The back of the truck was loaded with fruits and vegetables. The driver parked and sat on a stoop to smoke while he waited for customers. It was June and cherries were in season. I asked about a carton of cherries. “Quanta costa?” 5 euros for the whole flat he mumbled. I couldn’t believe it. In America, cherries in June are expensive. At Whole Foods they are about $4.99 a pound. That carton at Whole Foods would have been at least $25.00. The funny thing is the vendor would not sell me just a basket. The whole carton was for sale or nothing at all. I thought to myself what the hell am I going to do with a whole carton (12 baskets of cherries). I have nowhere to bake a cherry pie and as much as I like to eat cherries I couldn’t see putting down that many cherries. Usually, I eat cherries fairly slowly. I will eat a few and then chew the pit for a long time kinda like what I do with an olive until there is nothing left and the pit is smooth like a pebble that’s been in sand for many years. Then if I have it in me I try to spit the cherry pit as far as I can like I used to when I was a boy. Now a days I am a bit older and my lungs are weaker and I don’t spit like I used to, but it’s still fun. 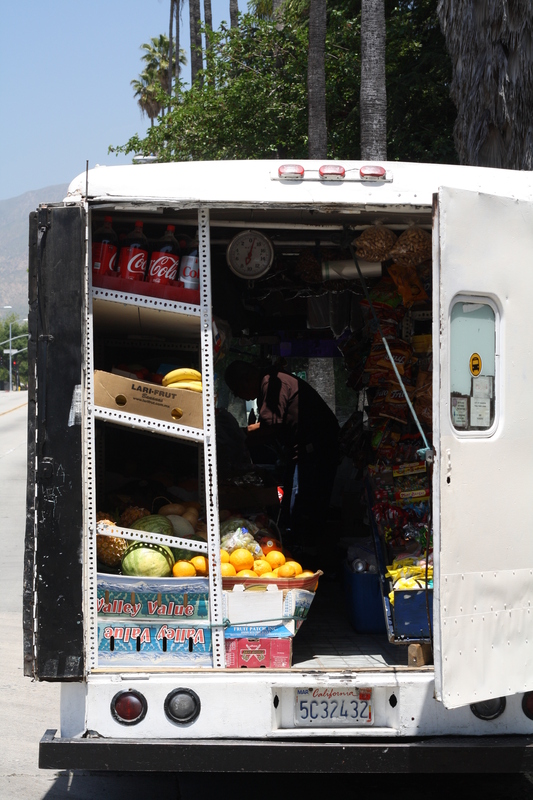 I thought about all of this because I saw this guy selling fruit out of the back of his truck. His truck was much different than the ape. It was more like a milk truck with doors that open in the back, but it brought back pleasant memories of Italy.